After weeks of dining at the same, tired chain restaurants, I had hit a culinary rut. 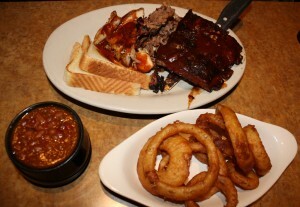 Pit Stop Barbecue and Grill in Brownsburg refueled my gustatory enthusiasm. By the time my stop was over, I left the Hendricks County eatery amazed, entertained, and, yes, satisfyingly full. Pit Stop is the culmination of decades of barbecue expertise set in an auto racing theme. The roots go back to 1961, when Harold Cottongim opened a restaurant on Indianapolis&apos; Eastside, serving authentic southern-style, hickory-smoked barbecue foods. That evolved to the acclaimed Harold&apos;s BBQ & Catering, the Northern Beach Catering Park and Celebrations Banquet Facilities. Harold&apos;s son, Eric, raced motocross as a child, then became involved in his dad&apos;s restaurant business, helping him become the track caterer at Indianapolis Raceway Park for 25-plus years. 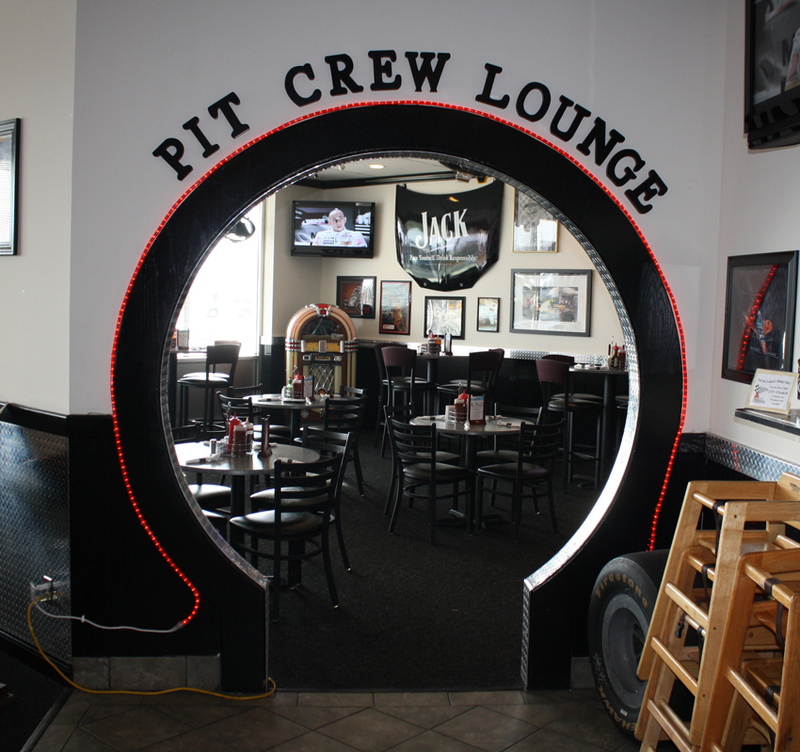 In 2009, it made perfect sense to open Pit Stop Barbecue & Grill, 932 E. Main St., Brownsburg, just a few miles from what is now known as Lucas Oil Raceway in Hendricks County. When I entered the restaurant, I was blown away by its racing decor and spaciousness. A vintage sprint car greets customers near the entrance, followed by posters, oversized framed photos, race tires, racing-themed liquor bottle collectibles and a tire-shaped entrance to the Pit Crew Lounge. Divided into several large rooms, the restaurant seats 190. The piece de resistance was the midget car, located in the back room. Kids, or kids at heart, could gleefully climb in and out of the vehicle. As for the food, I was duly impressed. As our server noted, the pulled pork is especially popular, so we started with the pulled pork nachos appetizer. The top cut of meat was luscious and tender, served atop a heaping plate of tortilla chips and cheese sauce. Likewise, the pulled pork quesadilla happily married BBQ and Mexican with plenty of delicate meat and BBQ sauce. Pit Stop serves much more than pulled pork, so my family sampled the BBQ combination platter, available in three or four meats. Our three-meat combo included perfectly grilled chicken, high-quality beef brisket and award-winning ribs that were gloriously pull-apart tender. All the meats are dry-rubbed and then slow-smoked for up to 12 hours. Squeeze bottles of sauce included sweet and original, the latter of which had quite an awesome kick. Texas toast accompanied the platter, as did a choice of two sides. The server talked up the BBQ baked beans, which included a compelling, peppery spice that made the side seem like a chili/baked bean combo. We liked the onion rings, which featured a crisp texture and beer-battered taste, even more. The &apos;q&apos; in BBQ stands for quality at Pit Stop. Other menu options include steak, seafood, salad (including a salad bar), sandwiches and burgers. A new creation, the Hemi Burger, combines a cheeseburger, pulled pork and onion ring in a bun. We&apos;ll certainly return for the Wednesday evening family buffet, which includes fried chicken, pulled pork, fried fish and a chef&apos;s choice entree along with mashed potatoes, baked beans, macaroni and cheese, buttered corn, fried biscuits, apple butter and yeast rolls with the soup and salad bar. Sundays feature a brunch with waffles, an omelet station and the works. Tuesday nights include vintage race films shown in the lounge until Memorial Day. Pit stops are best avoided in auto racing, but I plan to drive to this one repeatedly. Steve has served as blogger for the Hendricks County Convention and Visitors Bureau since October 2011. He is a veteran communications specialist with experience in writing and editing for newspapers, magazines, websites and books. Nurturing positive achievements is his favorite part of communications.